In the depths of the forest through trees and shadows she wandered. Sitting to drink she picks up her flute to play. The music drifts up through the forest canopy, out through the under brush. Where is the soft music coming from? Do you dare follow it? 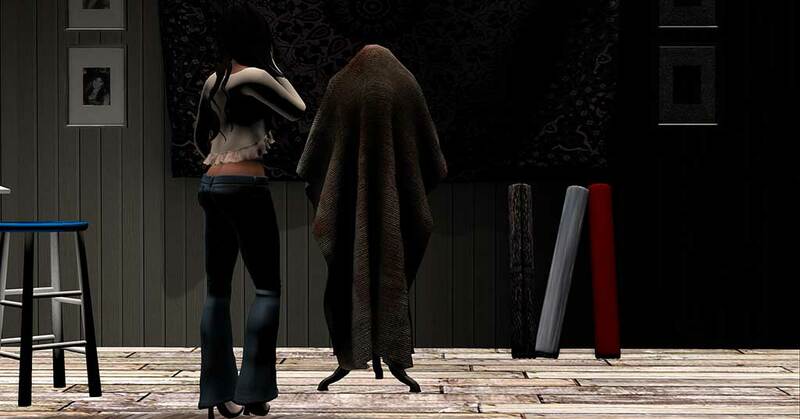 Anyone that regular follows Allusions and knows me in SL knows…I love jeans… I am always wearing them or making them! So without further ado, here are the jeans currently available at the SOS Fashion Event. I had a great time creating and participating in this event to aid in raising funds for a great cause! This particular pair is NOT a fatpack. This is a single pair in different mesh sizes. Here are some pictures of the items items you can find at the SOS Fashion Event! Crushed Velvet Vests! These vests are texture change EXCEPT the black one. A simple leather corset! Mesh! Allusions Exclusives @ Spoonfull of Sugar Event! 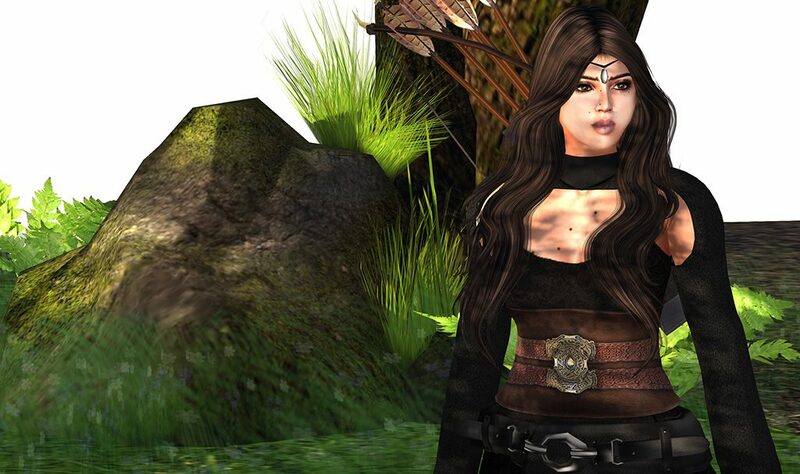 Allusions is participating in the Spoonfull of Sugar event on Second Life. This event will be raising funds for Doctors Without Borders. This outfit is an exclusive, 2 tops, 2 pants with Appliers for the omega based mesh bodies, Maitreya and Belleza. This is the One Of A Kind Auction outfit. Sara displays her freshly cleaned mannequin in the craft room. She searched for months trying to find a mannequin that went perfect in her new room, she wanted something crisp and fresh feeling. She gently turns the mannequin around, smiling as she takes in the pristine fabric cover and smoothness of the texture. “What a find!”, she giggles to herself, a bargain price for something that was so clearly a well taken care of antique. The sewing kit that came as part of it had many pictures inside of the previous family for generations, one clearly dated 1816. She loved discovering about the history of the family and their travels. She finishes decorating for the night and gently covers the mannequin carefully arranging the fabric so it doesn’t snag on the frame. Looking around one last time she nods in silent approval and the room’s decor and relaxing feel, eagerly anticipating tomorrow when she can start to work in her new room. She admires the frames she found that perfectly showcased the vintage photographs. The display set playing off the sewing machine corner well, already she feels inspired. She turns to leave then looks back to the photographs, this time her eyes focus with curiosity, something she did not notice before. The photos taken years apart, curiously share the same date, facial features, one would laugh to say they almost look like the same woman. She shakes her head and chuckles at her sudden nerves, “what utter nonsense” she mumbles to herself. Out of nowhere the lights that worked so perfectly before begin to flicker and the fabric draping the mannequin ever so slightly moves, like breath…she stops as if frozen watching in utter denial as the lights go out. She looks quickly towards the door then back at the mannequin. Her perfect crisp linen is now stained in blood, dark brown then getting a brighter crimson hue. Silence is what remains. A smiling woman sets up her camera posing with the mannequin in her craft room. Her dark coffee hair up in a soft bun with gently curled tendrils framing her face. The camera flashes and she prints the picture, the soft smile yet very alive looking gleam in her eyes. She frames it in the same style of picture frame as the other vintage photographs. She lets out a soft chuckle as she takes in the view of her brand new room.